Chocolate Peanut Butter Bars are one of the easiest and most delicious desserts around. Just a handful of ingredients and you’re on you way to dessert bliss. **UPDATE: this post was originally shared in 2012. Photos and text have been updated to better share my voice and photography skills. These Chocolate Peanut Butter Bars are a favorite from way back. I have to say these are one of my top 3 favorite desserts of ALL time. And I’m so not being dramatic. The other two are cheesecake and Lemon Hush in case you were wondering. I can do some embarrassing amount of damage to a pan of these if I’m left alone for too long. All self-control goes out the window. So as you can imagine, I only make these around for the holidays or for big gatherings. The majority of the devouring needs to be done by others for my health and safety. I made them for Easter last month and took the opportunity to rephotograph them to better showcase their gloriousness. 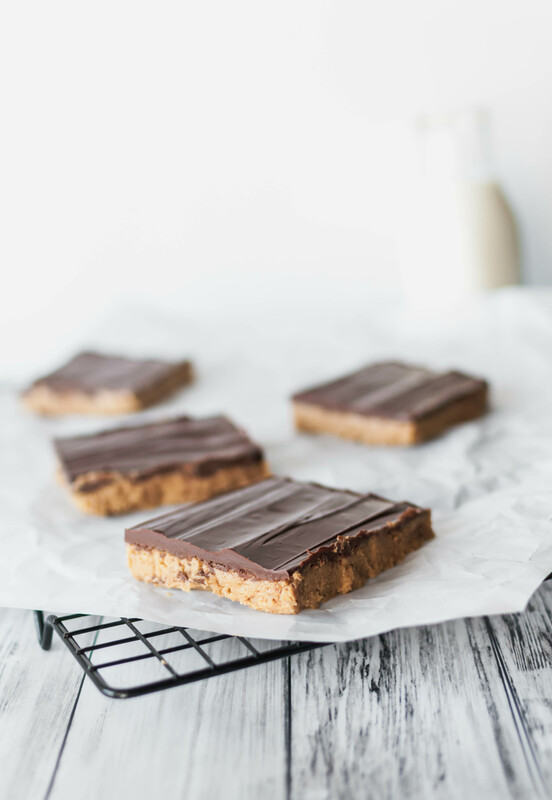 If you are a lover of the peanut butter and chocolate combination you are going to adore these simple, five ingredient bars. And the necessary ingredients are all very common ones that I almost always have on hand and I bet you will too. These Chocolate Peanut Butter Bars are basically like a peanut butter cup kicked up a notch. How could you not like this situation?! My favorite thing about these and what makes them better than a peanut butter cup for me is the graham cracker crumbs in the peanut butter layer. It adds a little crunch and texture which I really like. The chocolate layer on top has a little peanut butter mixed in to really put them over the top. With summer right around the corner, these are a great option for picnics, barbecues and grill outs with friends and family. They are simple to make, can be done ahead of time and travel well. You better believe I’ll be bringing them to all the gatherings this summer. In a large bowl, stir together butter, graham cracker crumbs, powdered sugar and 1 cup peanut butter. Spread evenly in a 13x9 pan. Set aside. In a microwave safe bowl, melt the chocolate chips and remaining 1/4 cup peanut butter in 30 second increments until smooth. Spread over the peanut butter layer. Refrigerate for 2 hours or overnight before cutting and serving. These look so good and also look very easy. I like the graham cracker addition. Will be trying these soon! Chocolate and Peanut Butter, what a bar! I would just love this treat. Hope you have a very special week end and thank you so much for sharing with Full Plate Thursday. 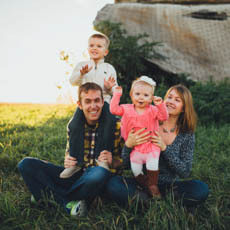 This is an absolute favorite of mine! Thank you for sharing your recipe. I am so excited to make this. My refrigerator would be full of these by tomorrow! Glad to hear it! Enjoy them and beware…they are addicting! These remind me of peanut butter crispy treats, but I’m loving the idea of the graham cracker crumbs instead of the cereal! Sounds delicious! Yes! They are so delicious and addicting! Thanks for stopping by and commenting Melissa.